Excellent Performance and Superior Cost Performance. It is the company's Core Competitiveness Product. All kinds of stainless steel, the first choice for finishing of ISO M materials. Stainless steel is an alloy material with a chromium content of not less than 12%. Other alloying elements may include nickel and molybdenum. The cutting process of stainless steel varies depending on the alloying elements of the material, heat treatment and processing (forging, casting, etc.). Generally, machinability decreases as the alloy content increases, but materials that are easy to cut or have improved machinability are present in all types of stainless steel. When the stainless steel is turning, the cutting edge generates a lot of heat, which is prone to groove wear and built-up edge. Ferritic and annealed martensitic stainless steels have similar machinability to low-alloy steels, so general turning recommendations for steel turning can be used. Sometimes hardened martensitic stainless steel is processed, which places high demands on the plastic deformation of the insert. Austenitic stainless steel is the most common type of stainless steel. This type of stainless steel also includes so-called super austenitic stainless steel, that is, stainless steel with a nickel content of more than 20%. Austenitic stainless steels are recommended to always use coolant to reduce crater wear and plastic deformation, and try to use a large insert radius. Bonding trends, built-up edge is also a common type of wear, both of which have an adverse effect on surface quality and tool life. A sharp cutting edge and a positive rake insert are recommended. Work hardening often causes the groove to wear at the depth of the cut, causing burrs on the part. A round insert or a small lead angle is recommended. 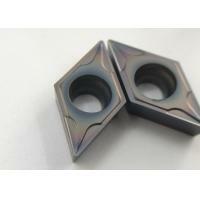 Duplex stainless steel has a two-phase structure containing ferrite and austenite. In terms of heat generation, cutting force and cutting control, the higher the mechanical strength, the harder the material is to be machined. 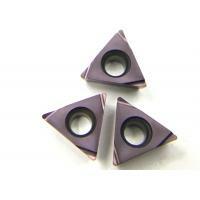 Common types of wear are flank and crater wear, plastic deformation, cutting impact and grooves. Use small lead angles to avoid groove wear and burr formation. 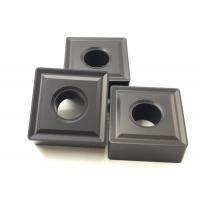 Use a chipbreaker with high edge strength to withstand high cutting forces. It is recommended to always use coolant to reduce heat. Considering the performance of different stainless steel materials, through excellent chipbreaker design, ideal coating and professional surface treatment technology, through a large number of customer application verification, the performance and life of stainless steel series turning inserts reach the level of mainstream brands in Japan, South Korea and European. The price has obvious advantages over Japanese, Korean and European mainstream brands. 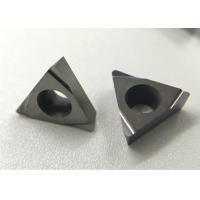 Suitable for finishing stainless steel with a depth of cut of 0.3-1.5 mm. 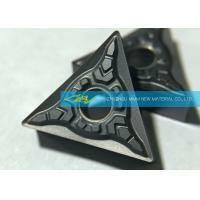 Sharp edge, good control of iron filings and excellent surface quality. 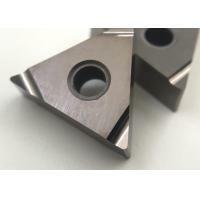 Strengthened the impact resistance of the cutting edge on the basis of sharp edge, suitable for semi-finishing and intermittent processing of various stainless steels. 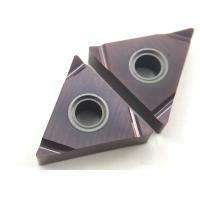 Chipbreaker designed for stainless steel's highly viscous, highly plastic, difficult-to-machine materials. 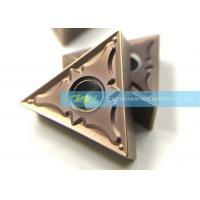 Strict quality control system to eliminate blade edge defects and stable quality. 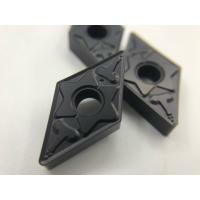 High coating hardness and excellent high temperature resistance. 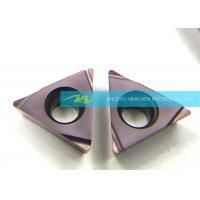 Special coating treatment technology, the coating and matrix are more firmly bonded. 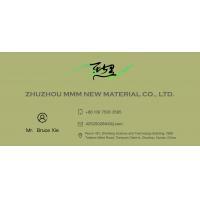 Since inception, ZHUZHOU MMM NEW MATERIAL CO., LTD. is always targeted to be an excellent supplier of cutting tools. We continuously improve product performance, product quality controls, company’s management and team building. The company has a high quality and professional technical team engaged in machinery industry for many years. On the basis of giving full play to the advantages of its technical service ability, we have been formed full range of products from blank to product, primary to high precision and so on which are including saw brazed tip, brazed tip, insert, CNC tool, tool system and solid carbide etc. 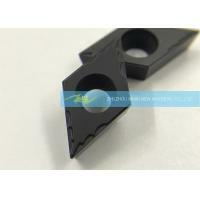 At the same time, we also have ability to provide customers with customized cutting tools, design, customization and OEM services according to the actual needs of customers.